V P Guest House, Restaurant and Bar in Rayong is a family run guesthouse on Hat Maerampung Beach, Thailand. We take our job seriously and are comparable with any hotel within the Rayong area. 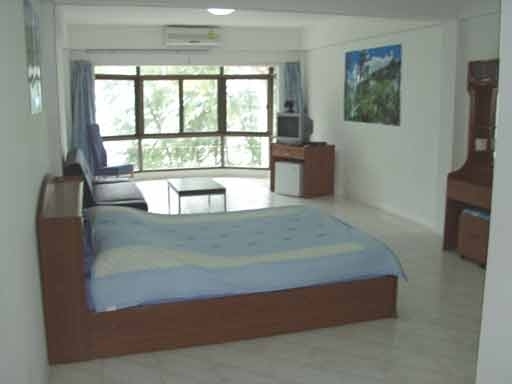 We offer good quality accommodation at affordable prices. We have been open since November 2004 and since then have gone out of our way to make our guest house have all the necessary comforts that people are looking for. We have a prime location being opposite one of Thailand’s most fantastic beaches, long sweeping soft sand and warm sea. Our rooms are to a high standard. Over twice the size of a normal hotel room. All have sea views and some a balcony to sit and relax in the sun. Air conditioned, TV with multi-channel digital UBC satellite receiver in every room, mini bar and en suite toilets. The rooms also have a settee that folds down into a double bed if needed. Downstairs we have a full size pool table, satellite TV and seating. At the front of the guest house we have installed a bar with draught beer and all the usual drinks. we also have a complete European food menu, satellite TV, palm tree lights and very comfortable seating area with a fantastic sea view. Now we have internet connection in all rooms and lobby. We also rent motorcycles of different sizes. We offer a pick up service from Bangkok airport or anywhere within Thailand at competitive rates. We can also offer many excursions (car with driver) to many destinations some very close to the guesthouse. We are right next to Ban Phe where it is possible to take a boat over to Ko Samet Island. Pattaya is 1 hour drive away if you would like some lively night life and shopping. Rayong has a large shopping area and some markets to explore. Wat Khow Sukim temple is also only an hour away which is a must to visit. A fantastic temple on the top of a mountain reachable by tram. At the base you can feed the fish and the turtles. They are really enormous. Within 10 minutes of the guest house there is a large food market every Tuesday. 3 hours away is the Thailand / Cambodian border market which is massive. You would need 2 or so days to walk around it. They rent out push bikes very cheap. Rayong is one of the east coast provinces with an enduring reputation for tourism, Rayong is rich in diverse landscapes, from cascading waterfalls, palm fringed beaches, to small islands, all well-known for their exquisite well preserved conditions. Another charm of this province is the blissful climate throughout the year, attracting tourists, both local and international, to visit and explore the wonders of Rayong. Apart from natural beauty, Rayong is a major seafood source in Thailand. It's also the land of tropical fruits, such as rambutan, durian, mangosteen to name but a few. A trip to Rayong is therefore not only for its beautiful beaches and scenery but also for the culinary delights of its food. Contact us if you need lodging in Rayong.